TURQUIE – Kırşehir- An ancient city has been uncovered in a Kırşehir village after historical artifact smugglers excavated the area. The city dates back to the Roman era in the second century and home to important artifacts. A bath, which was turned into a church, is being revealed during excavations in a 2,200-year-old ancient city, which was discovered by treasure hunters in the central Anatolian province of Kırşehir’s Çiçekdağı district. The ancient city came to light in Büyük Teflek village when historical artifacts smugglers excavated the area. Dating back to the second century B.C., the ancient city has a bath as well as other artifacts. Kırşehir Museum, Director Adnan Güçlü said that they had revealed a significant historic heritage during the excavations. He said that excavations started last year in April, adding that they would continue the excavations for two more months this year. Speaking about how the ancient city was unearthed, Güçlü said, “With the notification of law-enforcement officers and the village headman Eyüb Baran, we came to the village and made examinations. We entered the hole opened by treasure hunters and obtained information about the size of the ancient city. Then we discovered that this place was a significant place of settlement and a bath from the Roman era. The furnace of the bath was the first place we examined. It was still strong.These works took six months and during this process we unearthed an 800-square-meter area, a big part of the structure. This is a small bath and we think that it was a business place.” Güçlü said that following the excavations, the lost Roman city, which is estimated to date back to the second century B.C., was registered as a first degree archaeological site. He said that they also thought that the bath had been turned into a church. “Those who donated to his church were buried underground of the church. We found 21 male graves in this place and worked there, too. In Orthodox Christianity, there was a tradition that the men, who donate to a church, were buried there,” he said. Güçlü said that works had still been continuing and it was not possible to excavate and unearth the complex structures within a short time. “It will take too much to reveal the whole ancient city,” he said. EGYPTE – Louxor - Une équipe d'archéologues français et égyptiens a découvert cinq têtes de statues royales de l'Egypte pharaonique au sud de Louxor. Selon les experts, ces statues pourraient dater de l'époque du Moyen Empire égyptien, fondé il y a 4.000 ans. C'est une découverte archéologique rare et inestimable que celle que vient de faire une équipe d'archéologues français et égyptiens. Ensemble, ils ont retrouvé cinq têtes de statues royales datant possiblement de 4.000 ans. Le chef du département des antiquités pharaoniques Mohamed Abdel Maqssoud a précisé que chacune des têtes, couronne comprise, mesurait 50 centimètres, et estimé que ces statues datent de l'époque du Moyen Empire égyptien. Il a ajouté que des experts étudiaient actuellement les têtes afin de déterminer si elles appartiennent à des statues retrouvées décapitées il y a plusieurs années. "Les têtes de statues découvertes portent des couronnes de Haute et de Basse-Égypte sculptées dans le calcaire", a de son côté précisé le ministre des Antiquités, Mohamed Ibrahim.Parmi l'équipe d'archéologues à l'origine de cette découverte, le français Christophe Thiers. Egyptologue au CNRS et à l'université de Montpellier 3, il explique que "les statues sont extrêmement bien conservées". "Ce sont des portraits royaux dont deux portent des couronnes. Elles n'ont pas encore été extraites du site où nous les avons découvertes, car nous avons besoin de les étudier sur place", poursuit le scientifique. TURQUIE- Nicée/Iznik - A Roman theater dating back almost two millennia will soon open to tourist visits in Bursa’s İznik district.The theater, which was built by Cecillius Secunds during the reign of Roman Emperor Traianus around 1,900 years ago, is one of the few Roman theaters that have survived so well in Anatolia. Much of the theater was preserved because it had been underground, prompting the Bursa Special Provincial Directorate to spend the past two years endeavoring to unearth the ancient site.The restorations inside and around the theater have so far revealed some 300 coins, earth ceramics, seven galleries and skeletons of people, who are thought to have died because of an outbreak. INDONESIE – Sleman - An excavation team from Yogyakarta’s Heritage Conservation Agency believes a large temple lies buried in Sleman, Yogyakarta, after they discovered artifacts that indicate a site of religious significance. Archeologists from the agency, known as BPCB, found 19 blocks of temple stones, an antefix, a rooftop ornament, a makara (a sea creature in Hindu mythology often portrayed on temple entrances), cauldrons and other relics traditionally associated with temples. Experts have been intrigued by gold and silver pieces found with the cauldron. The pieces have tiny characters written on them that are still being analyzed. “Based on our findings, we are fairly sure a large temple lies deep under the ground as what we discovered is only part of the upper structure,” Wahyu Astuti, conservation section head of Yogyakarta’s BPCB, said on Friday. Wahyu added that the team will dig deeper in the hope of finding the foundations and uncovering more relics. However, the BPCB team is finding it difficult to extend the excavation zone as its surrounding area is dominated by privately owned buildings. The Yogyakarta area as well as Central Java in general is home to a large number of historic temples, boasting Hindu and Buddhist influences dating back more than 1200 years, including the ancient temples of Borobodor (Buddhist), Prambanan (Hindu) and Mendut (Buddhist). EGYPTE – Wadi el-Sebua - The Ministry of State for Antiquities has started to provide security in remote archaeological areas which were left without guards after the 2011 revolution. 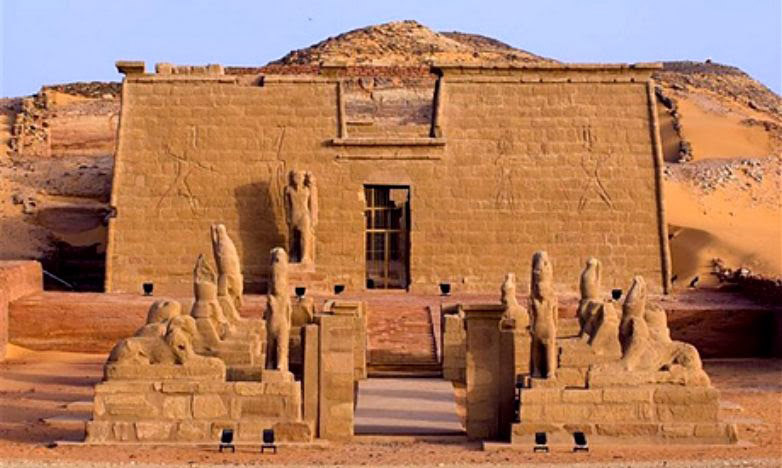 Ten ministry security guards at the Wadi el-Sebua temple area on Lake Nasser, south of Aswan, were armed with guns on Friday, in order to tighten security measures at the remote site. According to Antiquities minister Mohamed Ibrahim, the step was important for preventing further looting attempts, while he denied reports that the Wadi el-Sebua area had been recently subjected to looting, saying that only electricity cables and lamps used to illuminate the site at night had been stolen. Wadi el-Sebua, or the Valley of the Lions, is the name given to a Nubian temple built by King Ramses II at the end of his reign (1279 -1213BC). The temple took its name from the avenue of sphinxes that decorates its entrance. It temple originally consisted of a set of three pylons, but only two survive. The first, which led to the avenue of sphinxes, is no longer there, but the second, which leads into a forecourt decorated by statues of Ramses II and the third, which leads to a second courtyard supported by columns decorated by images of Ramses as Osiris, are still extant. The hypostyle hall and inner sanctuary that follow these courtyards were carved into the bedrock. Close by Wadi Al-Sebua is Dakka Temple, which was built much later during the Ptolemaic era. Like the more well-known case of the Abu Simbel temples, the Wadi el-Sebua temple was also dismantled and removed from its site in the 1960s to make way for the reservoir that would accompany the Aswan High Dam.